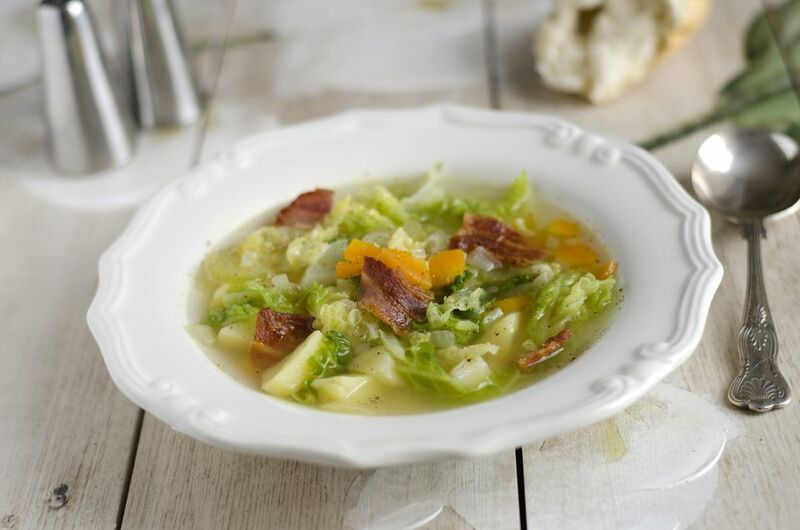 Potatoes, bacon, and cabbage team up to make a filling main dish soup for the slow cooker. Just add the vegetables and broth to the crock pot and set it for about 6 to 8 hours. All you have to do when you get home is add some sour cream and cooked bacon. Feel free to vary the ingredients with what you have on hand. Replace the leeks with extra onions or use diced ham instead of bacon. If you don't care for caraway seeds, just leave them out. Enjoy this delicious soup with crusty bread or biscuits. The leftovers make a fabulous lunch the next day, so don't worry if you make too much. Combine chicken broth, potatoes, cabbage, leek, onion, carrots, and parsley in large bowl; pour mixture into slow cooker. Stir in salt, pepper, caraway seeds, and bay leaf. Cover and cook on low for 6 to 8 hours or on high for about 3 to 4 hours (or until the vegetables are tender). Remove and discard bay leaf. Meanwhile, about 30 minutes before the soup is ready, cook the bacon in a skillet over medium heat. Or bake the bacon in the oven. Combine some hot liquid from slow cooker with the sour cream in small bowl. Add mixture to slow cooker; stir. Stir in most of the crumbled bacon and save a few tablespoons to use for garnish.